Last time I talked about the burrito class I did at the Wellness Community. 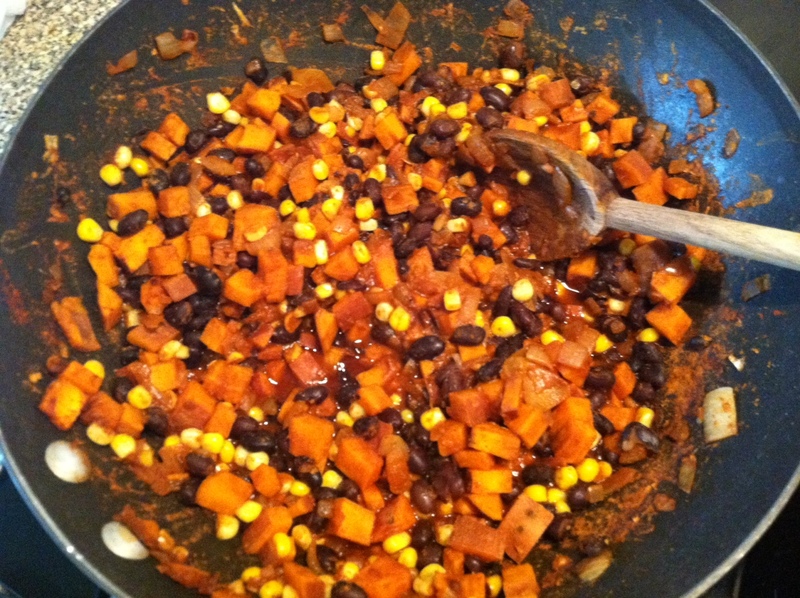 This is another one of the recipes that I made there, a delicious black bean sweet potato burrito. The recipe featured below is very much on the mild side, but for my family I like to spice this up quite a bit. You can do that by adding hot sauce or salsa, extra chili powder, or even chopping up a chipotle in adobo and throwing it in! Of course, I also know that sometimes people can be very, VERY sensitive to hot tastes after things like chemo, so you can leave the chili powder out of this one as well. Always tailor your recipes to your taste. This burrito also freezes well. For more of my musings on making your own frozen burritos to snack on at later point, please check out my previous blog. I will not retorture those who have read them before. Tomorrow, we are off to see Batman, but I know I am making some of my superduper greatly awesome breakfast scramble! I will try to post up some pics and maybe even a recipe. Dice the sweet onion. Heat a skillet over medium heat and add the onion. Cook until the onion is caramelized. Add a small amount of broth to deglaze the pan. Dice and add the sweet potato, beans, and corn. Add the paprika, cumin, and chili powder. Add salt and pepper to taste. Cook until the sweet potato is tender. Remove from heat, and roll up in a tortilla.